Experiments with solar-powered freezers could lead to future gains for fishers and poor communities. Women’s groups lead the way. Editors’ note: We invited WorldFish – a CGIAR research centre – to write about their work in small-scale fisheries. In this “Small fry” series, scientists from WorldFish describe some of their research. By implementing participatory action research, they collect information about processes and impacts in order to draw generalisable lessons and scale up innovations that enhance fish-based livelihoods. As the children paddle across Waisisi Harbour to school in the morning, fishers return to shore. Sometimes their catch is small and easily consumed by their households during the day. If there is more than necessary for the day, the catch is shared among other households, bartered, or sold. Sometimes the fish spoil. Some women earn income by selling fish and cooked fish-based meals in West Are’are. This part of Malaita Province in Solomon Islands is decades away from grid electrification, though people are adopting insufficient off-grid solutions such as diesel generators and solar panels. The area is the home of the Rokotanikeni Association. 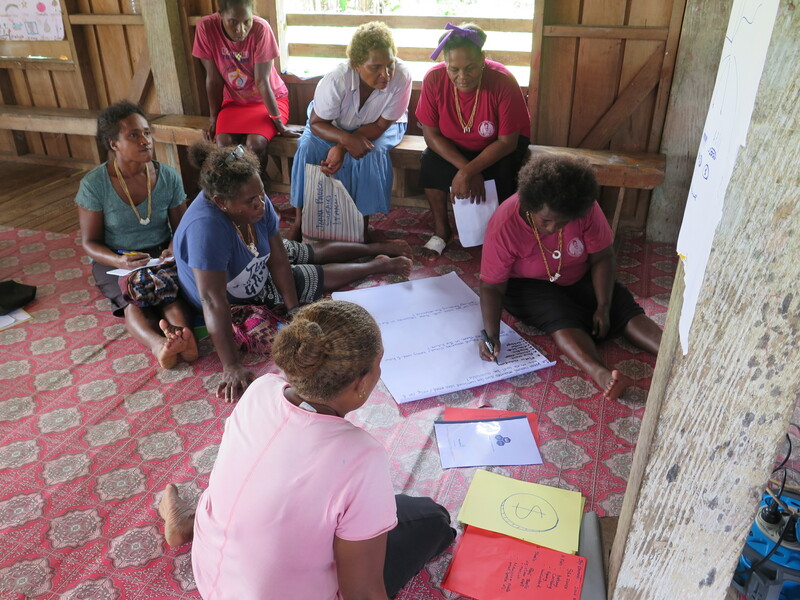 Rokotanikeni is a women’s savings club with over 1,000 members along the coast in rural West Are’are in Solomon Islands. The savings club generates income from selling fish, garden produce, and cooked foods at church fundraising events, local schools, or marketplaces. The women explored what livelihood opportunities they could see immediately for themselves, and how we could work together to “experiment” with the most promising idea. Ultimately, their idea was to try solar-powered freezers to store fish and other perishable foods, to help them in their small-scale business activities. Members from the West Are’are Rokotanikeni Women’s Association evaluate the feasibility of operating small businesses around solar-powered freezers in their villages. Photo: Hampus Eriksson, WorldFish. Rokotanikeni members are financially trained and well organised. Since the association’s inception, these rural-dwelling women have been supported by their educated kinswomen who live and work in Honiara, the capital of Solomon Islands. Practices for how the groups of women in villages would share responsibilities and money were already in place. In 2017 we arranged three solar-powered freezers in three different villages as pilots in the experiment. The groups have targets for how much they need to save to show that they are on a trajectory to replace any machine parts within their expected lifetime. For example, a battery lasts for about five years. Four months into the experiment, two of the groups had saved twice their target amount. The women store their foods in the freezer and make incomes from renting out freezer space in the village, so the initiative benefits community members. Now freezer committees operate small-scale enterprises in nine remote villages. 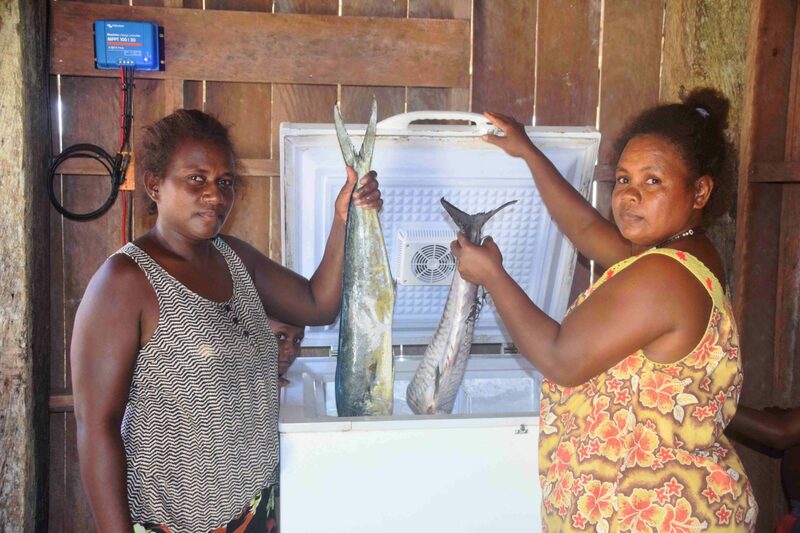 The freezers enhance the small-scale income-earning opportunities of the women, building on their existing business, cooking and selling fish. The experiment is in direct contrast to the current national strategy to build costly “fisheries centres” with landing sites and storage facilities around the country. These facilities tend to be disproportionately large to current fishing activities and have been riddled with issues around land ownership and maintenance. The freezer experiment with Rokotanikeni presents an alternative to these much more costly and centralised fisheries centres that are meant to provide a similar service – cold fish storage. The freezers are small and relatively cheap, with benefits in remote settings that include better food safety. Solar-powered freezers are becoming cheaper and more available – they could be set to transform remote Pacific island food systems. Read more about related WorldFish projects in the stories in this “Small fry” series. Opening Image: Solar freezer in surairo with members of the West Are’are Rokotanikeni Womens Association group. Photo: Tessa Minter, courtesy of WorldFish. Octopus represents both food and profit for small-scale fishers who live along the shores of the western Indian Ocean. Changes in the region have implications for fisherwomen that need to be addressed by fisheries policy and management to become more gender equitable. Fishers in Kenya earn a wage above the poverty line. Why do many of them feel that they are poor? Click here for low-resolution images.